Here comes a different kind of hot-stepper: A pair of Wellington boots that convert heat from your feet into electricity. The kicker? You can store up enough juice to charge a cellphone, so you can yak it up without missing a beat. 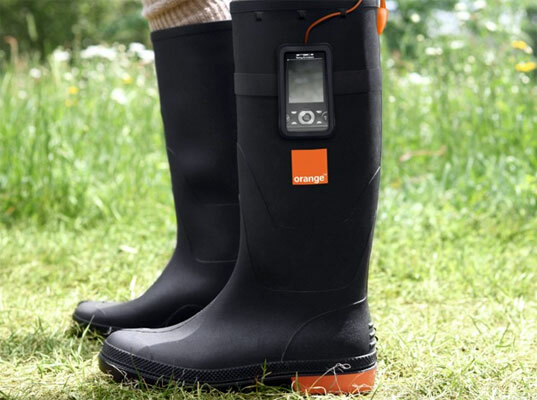 The Power Wellies are the result of a collaboration between Orange, a British telecommunciations company, and the renewable-energy gurus at Gotwind. A prototype made its debut today at England’s Glastonbury Festival, where Orange is the official communications sponsor. The largest greenfield music-and-performing-arts festival in the world, Glastonbury could not be more apt of a showcase—12 hours of stomping at the festival grounds will offer enough power to charge a cellphone for an hour. If you have more energy than time, just step up those moves. “The hotter your feet get, the more energy you produce,” a spokeswoman for Orange says. Thermoelectric modules in the sole convert temperature differences into electric voltage. The sole of each boot contains thermoelectric modules that convert temperature differences—say the warmth of your foot versus the cold of the ground—into electric voltage (see: Seebeck effect). When a sizable charge accumulates, simply plug in your phone into the power output at the top of the galoshes. Orange is no stranger to phone-charging innovations that tap into clean energy. Previous concept pieces have included a kinetic-energy-powered Dance Charger and the Power Pump, a twist on the traditional foot pump. Here comes a different kind of hot-stepper: A pair of Wellington boots that convert heat from your feet into electricity. The kicker? You can store up enough juice to charge a cellphone, so you can yak it up without missing a beat. 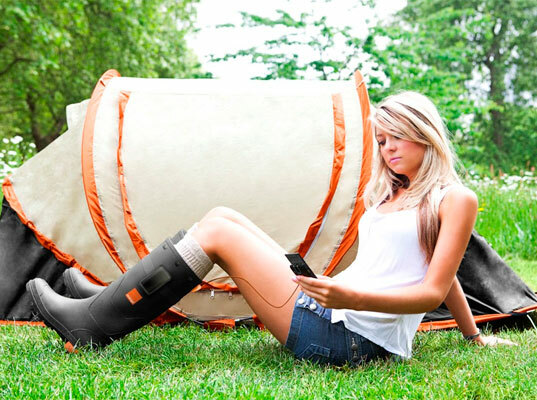 The Power Wellies are the result of a collaboration between Orange, a British telecommunciations company, and the renewable-energy gurus at Gotwind. A prototype made its debut today at England's Glastonbury Festival, where Orange is the official communications sponsor.